With a broad head of yellow daisy like flowers carried on a long stem emerging from a rosette of deeply toothed leaves, Ragwort is easily recognised at this time of the year. It is poisonous to horses and cattle and, despite all efforts to eradicate it, remains common and abundant on uncultivated land such as verges and neglected pasture. Quite often a close inspection will reveal the presence of the Cinnabar moth for which Ragwort is a common food plant. These are brightly marked with alternate black and yellow hoops, a sure sign to would be predators that they are not the tasty morsels they appear to be. 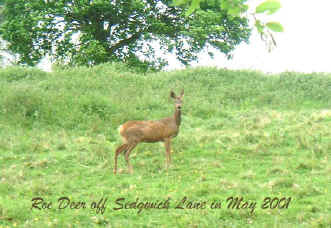 How smart the Roe deer look in their glossy smooth, reddish coats. They are locally very common are particularly adept at raiding gardens to browse on shrubs, roses and other herbaceous plants. They mate in July/August and yet, by the mechanism of delayed implantation, do not give birth until the following Spring. St Bartholomew’s day on the 24th “brings to cold dew” as the saying goes. This is when gardeners should bring tender plants indoors.